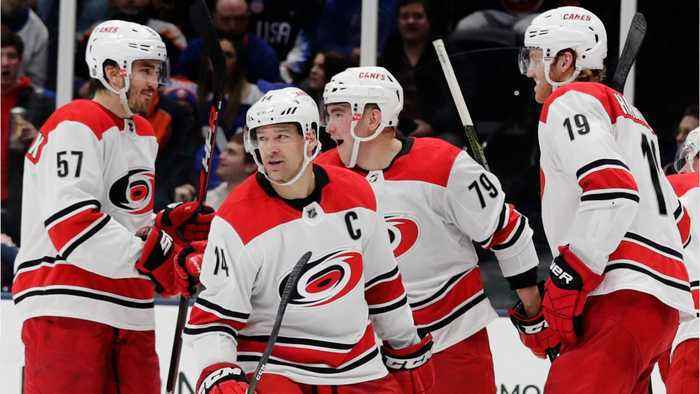 When we last checked in with the Carolina Hurricanes, just a few days ago, they had pulled off maybe their best ever home victory celebration yet—an homage to Duck Hunt, with sticks for guns and gloves for ducks. But on Saturday night, the ’Canes turned to another sport for inspiration. After beating the Wild 5-1 to earn a five-point cushion in the playoff picture, some arena employees brought out a dang basketball hoop onto the ice, and after the standard viking clap, the team ran a play for Trevor van Riemsdyk, who drove the lane for a dunk.